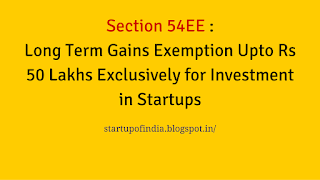 Like the provision under section 54EC under which long term capital gains upto Rs 50 Lakhs can get tax exemption, the government has introduced a new provision named as section 54EE in the Finance Bill 2016 to provide exemption from capital gains tax if the long term capital gains proceeds are invested by an assessee in units of such specified fund, as may be notified by the Central Government in this behalf, subject to the condition that the amount remains invested for three years failing which the exemption shall be withdrawn. The investment in the units of the specified fund shall be allowed up to Rs. 50 lakh. 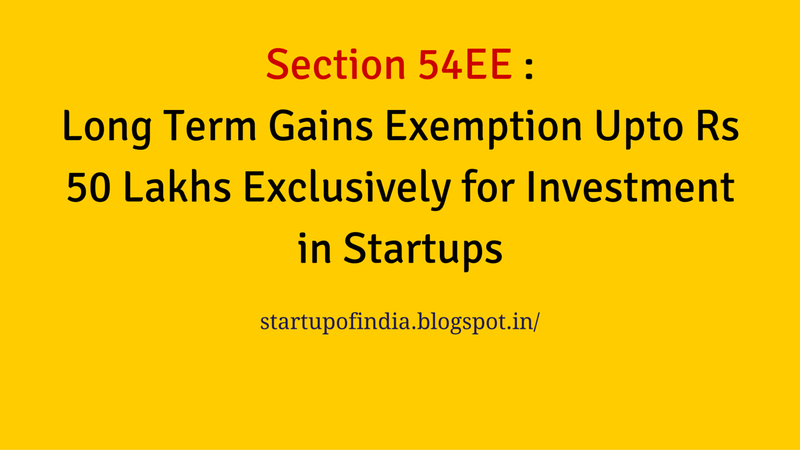 This specified fund shall be set up specifically for the startups in India. Provided further that the investment made by an assessee in the long-term specified asset, from capital gains arising from the transfer of one or more original assets, during the financial year in which the original asset or assets are transferred and in the subsequent financial year does not exceed fifty lakh rupees. (2) Where the long-term specified asset is transferred by the assessee at any time within a period of three years from the date of its acquisition, the amount of capital gains arising from the transfer of the original asset not charged under section 45 on the basis of the cost of such long-term specified asset as provided in clause (a) or, as the case may be, clause (b) of sub-section (1) shall be deemed to be the income chargeable under the head “Capital gains” relating to long-term capital asset of theprevious year in which the long-term specified asset is transferred. (b) “long-term specified asset” means a unit or units, issued before the 1st day of April, 2019, of such fund as may be notified by the Central Government in this behalf.’.